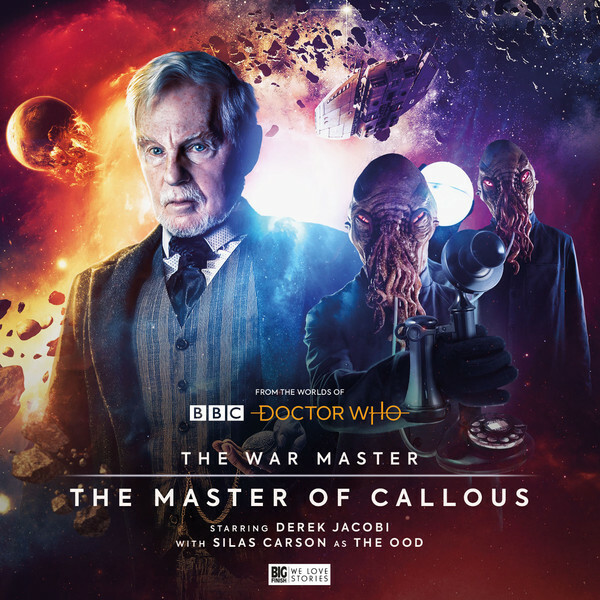 In this second War Master set from Big Finish, they have; instead of 4 stand alone stories, given us one ongoing 4-part story of the Master on one world. A bold and ultimately inspired move. James Goss and Guy Adams have penned these four stories that have the Master arriving on a mining planet (after making a few phone calls to the people there first) and on the surface seeming to help the people. But as we always know with the Master, his help never turns out to be all that helpful and always serves his ends. Getting Derek Jacobi for these sets is an amazing coo for Big Finish and is only more impressive to have done it twice, with a 3rd set in the bank (as mentioned in the extra). Judging by his time on the microphone in this boxset, they obviously must have had the tight schedule that comes with banking such a high profile name. But it just makes it all the more impressive how they do use him. In the first story, as I mentioned before, he is just on the phone. And he is only the more sinister for it. All the action that takes place feels Master lead and with so little done by him. As if causing people to do his bidding in person had become too easy for him. Then the Master comes in person, again manipulating things with a few choice words at the right time in the right ear. It just adds to his feeling of power. He seems somehow even more evil when he comes as a friend. When he inevitably does show his more evil side, it’s then almost seductive. The only time I did feel the character of the Master’s absence was felt was in the 3rd story. An engaging story that leaves two of the characters we follow for most of the set separated and giving powerful performances. But the Master feels more like a guest star in their story here to me; more than made up for in the finale though. After this boxset, I start to wonder if, despite such a fleeting turn as the Master on TV, if Jacobi’s Master might be the definitive version of the character. Not something I suggest lightly, but he captures the evil as well as the insidious charm of the character. He toys with his pray before leaving them in no doubt by the end what he is capable of and what he has done to them. I not only want to see more of the character, as it appears we will, but I want more of this long form story arc that shows the Master playing the long game. This set is devilishly delicious from the title to the reveal at the end. 9/10.